The Boy Scouts of America has a proud history fostering leadership and citizenship through outdoor activities. But the future of this well-known youth development organization may now depend on more than planning a camping or canoe trip. Objective: The BSA is positioned as a trusted advocate for youth. Showcase the youth advocacy and strategic relationships functions of the BSA. In public relations terms, “thought leadership” means providing valuable information to the community in order to achieve an enhanced public profile. In the case of the Boy Scouts, the issue on which it will lead is youth advocacy. To some local Scout leaders, serving as “an expert” may seem disingenuous and a deviation from the Scouting mission. Scouting is about fellowship, fathers and sons, and learning about life — often by exploring the great outdoors. What expertise do local counsels have to offer? Do people in the community really want to learn to build a campfire? The answer requires an understanding of the current social communication culture and the tactics now required to successfully market in this environment. In today’s world, branding is easy to create. A website and a social media presence can provide an air of legitimacy. The problem is: nearly everyone can develop this kind of brand. To advance an objective or grow a product, a business or organization must have something more to offer. The Boy Scouts of America recognizes it must become more than an organization of outdoor enthusiasts. It’s expertise is youth development and it must share that expertise in order to build its brand. The benefit: the notoriety that comes with being a thought leader is equivalent to thousands of dollars of advertising. A non-profit organization that boasts a thought leader will likely secure more fundraising dollars. To back up this thought leadership strategy, the BSA plans to implement a number of progressive public relations tactics – tactics the organization admits are a dramatic departure from the their past marketing efforts. In previous years, the BSA took a hands-off approach when it came to local marketing – preferring the local councils market according to their own community standards. But as communication became more social, the national office discovered the local council’s divergent marketing had diluted the BSA’s traction in the marketplace. The organization lacked a consistent, unifying message. 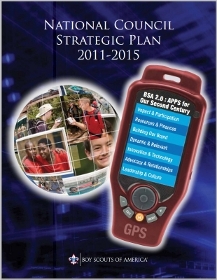 As part of its National Strategic Plan, The BSA national office is now developing and honing its PR strategy and filtering it down to the local councils who will then use social media and other multi-platform communication techniques to promote thought leadership to parents and young people. If successful, the BSA believes its marketing plan will build and strengthen a brand that is both “cool” to young people and respected by parents and financial donors. So how do Scout leaders become thought leaders? On the national level, the BSA intends to secure high-profile speaking opportunities to address issues relevant to today’s youth. The organization will also pitch national media on issues of youth advocacy that tie-in to BSA programming. As part of their top-down marketing strategy, the BSA will provide training to local Scout leaders to help them understand the new marketing culture in which they now must operate. Local Scouting executives must realize being a thought leader doesn’t necessarily mean you have to be an “expert”, even though that’s what the phrase implies. In the world of marketing and public relations, being a “thought leader” really means being a conduit of information. In Mobile, Alabama (where I recently began counseling the local Boy Scout Council), the city council considered a plan to implement a youth curfew. The issue led to heated debate on youth opportunities (or lack thereof) and the role of the police and city officials in dictating how and when young people needed to be off the street. It was the perfect opportunity for Scout leaders to exhibit thought leadership. By engaging in the debate and speaking out at task force and city council meetings, the Scout leaders could extole the virtues of Scouting and encourage funding of youth activities as an alternative or addition to a curfew. Sharing these opinions with the local media and on social media would also have enhanced the organization’s public profile and made donors, local political leaders and parents take notice. Join youth advocacy organizations in the community. If possible serve on the board. If these organizations don’t exist, create them. Post your thoughts, suggestions, articles, tweets or whatever on your blog, social media site or wherever you communicate with the public or your membership. Thought leaders, in today’s world, drive debate. They seek out answers to complex problems and encourage discussion to find solutions. They compile information and present it to their stakeholders and the community in an organized form. They are reliable sources of information. In a world where social communication drives consumer opinions, being a respected “thought leader” will allow the BSA to build its brand in a crowded marketplace and achieve success. Mark Roberts is Principal of ViewMARK Communications, a strategic communication consulting firm that provides marketing and public relations solutions for businesses, political candidates and non-profit organizations on the Gulf Coast of Alabama.